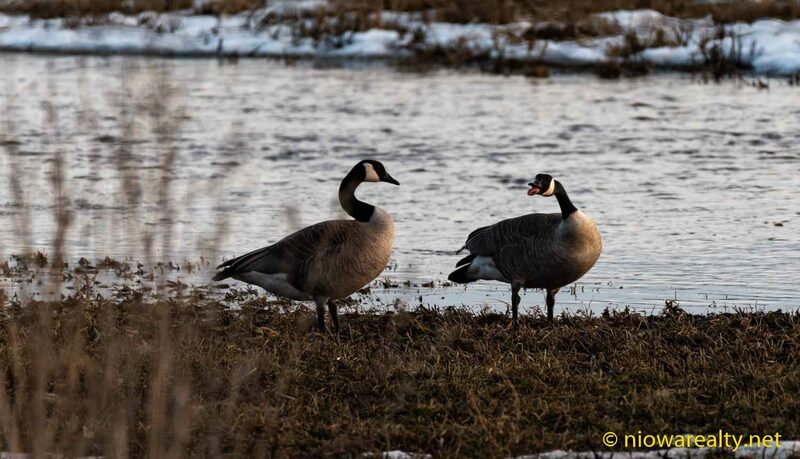 Share the post "Beating Them"
In spite of the low-lying areas getting water, we should all be glad that the snow is melting more slowly than if we had instant 50 degree days. There are still huge piles of snow around town, but that’s just OK because it’s better to have a slow melt than a fast. While driving down North Kentucky Avenue, I was shocked to see the size of those chunks of ice littering East Park. It looked as if in the night, some giant had walked thru the park randomly scattering the those sections of un-melted river ice. For sure there’ll be a Spring clean-up down there before the grass begins to grow. The back alleys of the Downtown are littered with refuse that must’ve been hidden in the melting snowbanks. After the snow is gone, I’ll have one more job of picking up all that paper and plastic in at least the back alley behind my building. I’ve found it always best to walk that whole stretch of block because if I don’t get everything, the wind usually finds a way of moving it around all the more. I did visit with a prospective seller today regarding the sale of a home here in the City, and hopefully he’ll have me go out yet this week to give him an idea of value. The one thing he said which surprised me was, “We’ve never always seen eye to eye on everything, but one thing I’ve noticed about you is your candor, so I’m not going to be worrying if you’re just telling me some big price just so you can get the listing.” I thanked him for the compliment and assured him after taking a walk-thru on the home, I’d try to get as close to what I believe its market value is. Around mid-morning I received a call from that out of State bank I’ve been in communication with regarding an old mortgage that needed to be released. Thank goodness the gentleman did a follow-up call to me because I’d not heard from them even after I sent a second email asking for a timeline. Since their office is out West, I was all the more thankful we didn’t get hit with the flooding Nebraska and the Dakotas are now suffering. For a backroom banker, he was quite the delightful chap. We talked about the weather, the changes taking place in the banking industry, and even how much I’d like to see a branch of their bank being opened here in Mason City. The reason I mentioned it, is because the few times I’ve ever needed something from them, they’ve always been courteous and helpful. I did schedule a public open house for this weekend, but I’m still thinking it a bit early due to the amount of mud and dirty snow still out there, and unfortunately some visitors at open houses aren’t as soulful as I am regarding the taking off of shoes when walking into a clean home. I just looked at the weather forecast this afternoon, and it looks like it is going to break 50 degrees on Saturday. I mustn’t forget to say, “Welcome to Spring!”, and if you’re a little more restless tonight, it’s likely because the moon will be at its fullest. Thank goodness there weren’t the crazy happenings today which I was expecting, other than an exceptionally angering situation having taken place during my late showing at the very last home I had to open for a young gentleman and his father which was a cheaper bungalow that had recently been vacated by tenants. When walking in, we could immediately see they weren’t the cleanest of people, but that’s usually the case with some of the older and cheaper rentals here in the City. As we were making our way thru, I kept getting this “feeling” there was something there that I didn’t want to end up finding. While standing in the hallway between the bedrooms, I had this “prick” on one of my legs which caused me to look down, but there was nothing to be seen. After getting a good look at the main floor, we went to the basement and just after hitting the bottom step I could smell cat. I turned on the lights and wouldn’t you know it, there lay random mounds of cat feces which caused one of the buyers to bolt. Well, while they were looking at the mechanicals, I kept having that “feeling” something was on me so I looked down at my pant legs, and there they were. I did a knee jerk yell, “Fleas!”, and off I went up the steps as I was beating them off my pant legs. I turned off all the lights while they were hurrying themselves outdoors. All three of us were shaking and beating our clothing in hopes we had them off. Rest assured, nearly everything I was wearing came off and into the washer when I arrived home. I’m only hoping there weren’t any on me that decided to make their new home in my car. I’ll never ever understand how anyone can live in a home that’s infested with fleas. I’d be ready to go out of my mind if I had to spend one night in that house. You can bet I’ll be placing a call in the morning to that listing agent. Tonight’s one-liner is: If you go long enough without a bath, even the fleas will leave you alone.